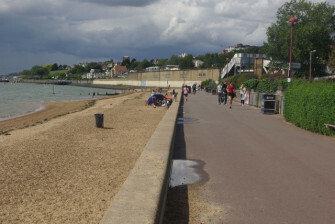 Recorded at Jocelyn Beach, in Chalkwell, by the station. The beach has some kind of history where it was a private beach and nothing to do with the council. Essex Record Office should know all about that. Recorded with a better mic, still not great in a wind, could be better when it’s quiet but fine when there’s a lot of noise going on. This is on the breakwater, the tide coming towards you on both sides, the waves breaking at different points with different noises. A minute or so in you hear two voices, a couple come down to go swimming. If you catch his voice you might hear what sounds like a Glasgow accent so, Lanarkshire or Renfrewshire. He did ask if I was intending to swim, and that it was lovely once in. There seemed to be a lot of swimming throughout the year last year. Finishes with a train going out of Chalkwell station. Image of Chalkwell Beach used under Creative Commons (Attribution-ShareAlike) licence. View the original here. Thanks for sharing! I wonder what the beach sounded like in her day. I have the book called Jocelyn beach.